It aired last night on AMC and due to some crazy circumstance Kristen and I are only now reeling from the shock of it. 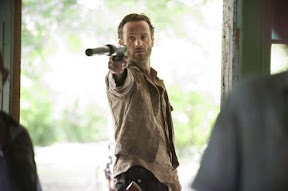 And if "Seed", the season premiere episode of The Walking Dead is any indication, we are in for a hella scary ride rife with high-tension drama, and thankfully bereft of last season's lingering too much around Hershel's farm. The production values also seem much higher 'cuz this episode cost an arm and a leg. Okay, so how long has it been since the events of Season 2? Because Lori's little bun in the oven is looking like a full-baked poundcake. I'm guessing that the producers are allowing much bigger spans of time to elapse so as to accommodate the imminent growth spurt of Chandler Riggs (the young actor playing Carl). Speaking of which, looks like Carl is gonna be turned loose a bunch more to break bad on the walkers this season. Hopefully that'll save Rick from screaming "CAAAAAAARL!" all the time (yah I'm looking at you Damon Lindelof and Carlton Cuse). Loved the prison: this is gonna be a crazy good setting for the coming season. And Michonne was just onscreen enough to satisfy our wanting to get our first good look at her without unloading the full bore of her katana-wielding finesse. A very, very strong opening for a new season of The Walking Dead. One that might well draw in a horde of new viewers. Looking forward to next week's episode... and the eventual introduction of the Governor into this already insane mix.